Beautiful, with a general appearance that reminds of a wild feline, he accepts our affection little by little, becoming a great companion. Several characteristics emphasize the wild look of the Abyssinian: the lithe and sleek body, and the glossy coat, intercalating light and dark colors, as in the African wild cat; the eyes delineated by dark skin and a rim of lighter hair, with an almost vertical stripe resembling the Puma; and the rapid and quiet movement, on the tip of the feet, like a Panther. 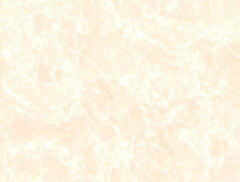 The ruddy color, also know as tawny, is the most traditional. Other four were developed later, one of which, the silver, is still not accepted by all American entities. They give it a pedigree, but do not allow it to participate in expositions. That is why in Brazil, only the Brazilian Cat Club, affiliated to European FIFE, gives out titles to silver individuals. Curious and brave, always alert and interested in everything, the Abyssinian is an accomplished hunter, that may very well survive on its own. A freedom lover, it needs a spacious place to live, but adapts to smaller environments as long as it doesn't feel lonely. He is shy in the first contact. But with time, if we allow him to espontaneously come closer, he will let us caress him, and will become very affectionate and friendly. This information was given to us by Zillah Ayala, director of Genetic Department of FCGB (Federation of Cat Breeders in Brazil), affiliated to American TICA, and also owner of Cattery Curumim, in Porto Alegre. He likes to be envolved in the family activities, and loves to be caressed and getting attention. It is easier to live with him if one accepts his exuberance, and understands and accepts his strong feline temperament. Attentive, he is a fast learner, and easier to teach than other breeds. Unlike the majority of the cats, the Abyssinian gets along with dogs in general, and loves water, going towards it when the opportunity arises, and sometimes even swims. Father and mother look after kittens very zelously, and he is very dedicated to them if she is absent. Abyssinians have very quiet voices. His resemblance to drawings found in the temples of Nubia, Egypt, and other mummified cats found in tombs as ancient as 2.000 b.C. lead us to believe he descends from the sacred cats of ancient Egypt, which is close to Abyssinia, and England, where the breed started, as a result of breedings of individuals brought from Abyssinia in 1868 by british soldiers, and other English cats (red, silver and tabby). 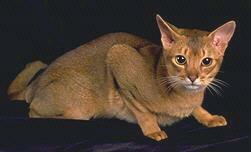 The Abyssinian was officially recognized in 1882, in England. It is currently an official breed in all feline entities. In the USA it has become one of the breeds that gathers more participants in expositions. In Frace, there is a club of the breed, and in Canada it is very popular. In Brazil and other countries of the world, it is still considered rare. General Appearance: Triangular head, with forehead and skull slightly curved; curved neck, rather flat muzze; large, some-what pointed ears; big almond-shaped eyes, in gold, green or copper colors; medium sized body, well muscled, with slightly curved back; thin and long legs; oval and compact feet; long and narrow tail. Coat: Medium length, dense, smooth texture, with 4 to 6 alternate color bands, dark at the tip of hair, and light at the root. No white spots except in the nostrils, chin and upper part of neck. Tabby markings in legs and tail may indicate bad breeding, and are a disqualifying fault in competitions. Colors: Ruddy (warm brown and black); sorrel (copper red with red-brown ticking); blue (beige with light and dark gray); and beige-fawn and silver. Kittens are born dark orange with black spots, or practically black. Colors start emerging on the 6th week, and reach permanent color only after 6 months or more. Special Care: Brushing every other week with a soft bristles brush. Clean ears with cotton swab and borated water weekly up to 8 months of age, and after that, only when they are dirty. Cut forefeet nails regularly (the hindfeet nails wear out naturally). Brood: 3 to 4 kittens, or more. Life Span: Average of 12 years. We would like to thank the breeder interviewed, and Edgardo Emilio Michel, president of the Clube Paulista do Gato, for editing the text.